I have a job applicant who has notified me they have a disability. What should I do now? Focus on abilities first. Address accessibility accommodations after the hiring decision is made. In-Depth answer: I have a job applicant who has notified me they have a disability. What should I do now? ACME Corporation is an equal opportunity employer. We will not discriminate in employment, recruitment, and other conditions of employment against any job applicant on the bases of race, gender, age, sexual orientation, or disability. But what about the practicalities of dealing with the disability question when it comes up in the application and interview process? What makes disability an outlier? Is the technology that we use in our office inherently accessible to someone with this type of disability? If our technology isn’t inherently accessible, is there an interface solution that allows this candidate to interact with our technology? These questions don’t come up when we’re considering a candidate who has a different gender, religion, etc. So disability by its nature raises these additional technology questions that must be answered. The answer to the first question is something that the hiring personnel need to know; and the answer to the second question is something that the candidate is best positioned to answer. Our advice though, is to address these questions only after considering the candidates abilities first. Note: The information in this article is pertinent to hiring, promotion, and retention of people with disabilities. For simplicity, we use examples based on hiring, but the strategies and issues also apply to those other areas. Think for a moment of the range of human functional abilities. Seeing, hearing, speaking, physically manipulating, moving, remembering, abstracting, etc. A disability commonly affects only one of these functions, and the affect is on a scale, from mild impairment, to severe impairment (e.g., mild hearing loss to complete hearing loss). One disability typically has no affect on the many other abilities. This thought is part of a key concept, and that is “don’t define us by our disabilities; define us by our abilities”. More important and more pertinent to the same key concept is the skills and abilities that are pertinent to the job: You’re looking for an accountant. The candidate has a degree in accounting. You’re looking for someone with good people skills. The candidate has a charming manner and converses easily. You’re looking for someone who can work in Drupal. The candidate has three years of experience working on projects using Drupal. Forget the disability. Concentrate on the abilities. Guidance on interviewing job candidates tells us to stay away from the areas of difference and instead focus on the areas of competency to perform the tasks of the job. But, disabilities are often overt only when we meet face to face, and it’s easy to make the mental slip and focus on the difference (you have a cane, you have an assistance dog, you use a wheelchair, etc.). 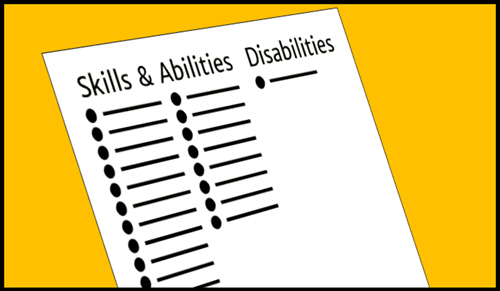 Focusing on the difference takes you away from the task of assessing the candidate based on their skills and abilities, which are going to be a lot longer a list than the list of their disabilities. For some issues, the questions might have a straightforward answer. The candidate uses a wheelchair. Do we have wheelchair accessible restrooms in this building? Check. Do we have accessible elevators and a level route from the front door? Check. Is our intranet conformant with web accessibility requirements? Do our software platforms pass accessibility checks? Do we send out company wide emails and memos with accessible formatting? Is there an alternative to the fingerprint door scanner for people who don’t have hands? For any company that asserts that it “will not discriminate… on the basis of… disability”, these are the sorts of questions that should be addressed regardless of, and prior to the question of whether individual candidates with disabilities are applying for jobs at the company. Which came first? The accessible technology in the company, or the employees who couldn’t do their jobs because the technology in the company was never addressed for accessibility? If the fingerprint scanner is the only way in, then war veteran Fred who has no hands but is perfectly capable of typing is going to be passed over. Personal magnifiers, to allow people with low vision to read projected presentation materials from across the room. The list of available AT is very long. There are databases of AT containing thousands and thousands of physical and software products. You don’t need to know what they are. Instead, it’s acceptable just ask the candidate. “Can you tell me what sort of assistive technology you use, if any? We’ll need to make sure that make provisions for that if you are the successful candidate”. And then let them tell you. They’ve been the ones using their AT for a while, and they have the best knowledge of what that entails, and how the AT can be used in accommodating job tasks. This exchange of information can help make the candidate feel comfortable that you have recognized and will address any accommodation needs, and, importantly, that this aspect is a separate consideration from your hiring decision. Large organizations typically have an accommodations office, that provides employees with ergonomic keyboards, standing desks, and AT when needed. The accommodations office usually doesn’t take a guess at what the employee needs; they ask them what has worked in the past, whether they already own devices that work well for them that might be interoperable with the company’s technology environment, and/or what new technologies are most likely to work for them in this specific work environment. Costs of AT accommodations are typically handled by the accommodations office as part of a central budget for the company. Compromise in the choice of AT solution is sometimes needed, but generally speaking accommodations are inexpensive and not difficult to implement. (The job of the accommodations office is to make the transition into the workplace as smooth as possible, absolving the individual department personnel of the need to learn about and install assistive technologies). There are practical questions around the installation of software based AT. Typically, policies do not permit the installation of individualized software on company machines, because of concerns over IT security. If accessibility has previously been tackled as an organization-wide initiative, then the likelihood is that when the IT department is approached with a new AT software request, they will be receptive, understanding of the need, and will work collaboratively to ensure the solution is in place promptly when the candidate has been hired. In summary the question of suitable technology accommodations is best answered by the candidate, but is made feasible and practical by addressing technology accessibility as a corporate wide venture. This article has focused on technology related aspects of the existing work environment, and accommodations for individual candidates (for hire, for promotion, etc.). There are, of course, other non-technology related accommodation needs that may need to be considered, such as flexibility in hours and flexibility in inclement weather (it’s hard to get a wheelchair through foot-deep snow, and it’s hard for guide dogs to walk on patches of ice). These sorts of non-technical accommodation need can be addressed by liaising with HR and providing appropriate policies. Transitioning from the ubiquitous ‘diversity footnote’ to prevalent hiring and promotion of people with disabilities is possible, it is less expensive than you likely imagined, and it is likely much more practical than you likely imagined. Always keep in mind: Abilities first. The Guides section includes A roadmap for organizational accessibility for large ICT vendors, An introductory guide for small businesses and startups, and Beyond offering employees a complaint process: proactive measures to tackle accessibility issues. The Q&A Articles section includes Why would I want to address accessibility in my organization?, and Does accessibility have to be expensive? ‘Skills and abilities over disabilities’ by Chris M. Law & The Accessibility Switchboard Project. CC BY-SA 4.0.